Edinburgh have bolstered their second-row resources with the signing of Cheetahs second-row Izak van der Westhuizen on a two-year deal. 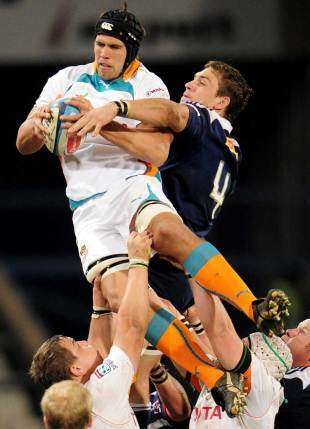 The lock has played in all 12 of the Cheetahs' Super Rugby games this season and will play alongside the likes of Sean Cox, Grant Gilchrist and Steven Turnbull next term. Van der Westhuizen will arrive at Murrayfield in October due to the Currie Cup and has highlighted Edinburgh's style of rugby as one reason behind him opting to swap Super Rugby for the RaboDirect PRO12. "I want to test myself against the top players in Europe so when I found out Edinburgh Rugby were looking for a player with my skill-set, I was desperate to sign," van der Westhuizen said. "I like the pace the boys play with, it's very similar to a Super Rugby style which gives me a lot of confidence that I'll fit in well. "I run the set-piece for the Cheetahs but, when the ball's in play, I like to be in the centre of the park getting stuck into the physical side of the game and hitting rucks." Van der Westhuizen's signing follows in the footsteps of WP Nel, Ben Atiga, John Yapp and Richie Rees in signing for the Heineken Cup semi-finalists and coach Michael Bradley is looking forward to the squad pushing on next term. "Over the course of this season we have been putting the right building blocks in place to tackle what is arguably the most eagerly anticipated season in the club's history," Bradley said. "Reaching the Heineken Cup semi-final set the benchmark for our players' performance so we have recruited and retained a number of key players to bring consistency to our season and set a new standard for Edinburgh Rugby. "The increased investment in our squad from Scottish Rugby will not only intensify the competition for places but means we will be on a much stronger footing to compete on all fronts, all season."